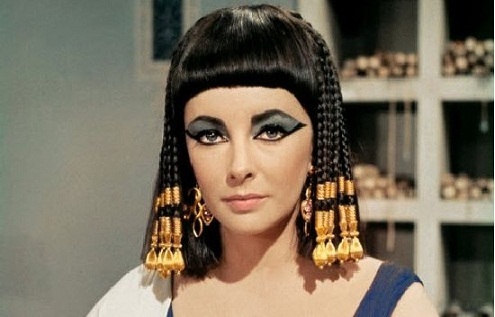 'Cleopatra', notable for being the most expensive movie ever made, the subject of heavily-consumed gossip fodder, and it’s place as one of biggest Hollywood ‘flops’ of its time, carries a lot of baggage. But unlike the glorious rediscovery and new appreciation of Michael Cimino's equally-loaded 'Heaven’s Gate', 'Cleopatra' never surmounts its expectations as a bloated and creatively bland sword and sandal picture. The picture started with Rouben Mamoulian as director, Peter Finch and Stephen Boyd as Julius Caesar and Marc Antony, a budget of $4 million and ended as a Joseph Mankiewicz film with Rex Harrison and Richard Burton opposite Taylor and with a bottom line of 44million of 60’s bucks. The story follows the well-known historical facts,after Julius Caesar’s defeat of Pompeii, his world travels to establish his empire, specifically his time at Egypt. Caesar meets Cleopatra introduced first rolled up in a carpet to gain the attention of Caesar in secret and garner his support against her political rival (and brother) Ptolemy. Cleopatra with her political savvy and ample bosom seduces Caesar and wages war on Ptolemy, taking control of Egypt forming a duo of power in the region. Cleopatra promises Caesar a son if they marry and consummate. They do and Caesarian is born, presumably to be Caesar’s heir. +But after the Senate disposes of Caesar Cleopatra finds herself aligning with his right hand man Marc Antony to preserve her power. The four hour plus length is structured in two halves, the Cleopatra/Caesar story and the Antony/Cleopatra story. Cleopatra’s lavish entrance into Rome is the central set piece of the film and the scene most recognizable to the picture. It’s indeed a terrific scene, enhancing the theme of Cleopatra’s desire for power and control, and the unbridled hubris to achieve it. It also represents the excessive indulgences of the film’s actual production, Liz Taylor’s reported on-set behaviour and her public tryst with Burton. As fact and fiction merge in 1963, it was impossible for this film to stand on it’s own as a solitary piece of filmed entertainment. The film works best in the first half, culminating in the death of Caesar at the hands of the jealous senate. The Atony/Cleopatra love story is buoyed only by our knowledge of Burton and Taylor and real life illicit lovers. The offscreen sparks never make it to the big screen. Burton and Taylor are burdened with clunky on the nose dialogue perfunctory to these epic films. Even the action scenes, only a few concentrated toward the end of the picture never rise to the benchmark previously set by Kubrick (Spartacus) and David Lean (Lawrence of Arabia). Cleopatra’s 70mm photography looks grade A on Blu-Ray highlighted by the general crispness of colour film stocks at the time. It’s just the content that’s soft in this picture.